John Smith’s Extra Smooth will be reduced from 3.8% alcohol to 3.6% - and the price per pint is set to rise. The change is not just because of the rising costs of production, and reduced beer sales in Austerity Britain, but in response to high tax rates. The government’s attempt to tackle problem drinking includes a lower rate of duty on beers with lower alcohol content. The change should save Dutch brewers Heineken, who own the brand, £6.6m in duty per year. 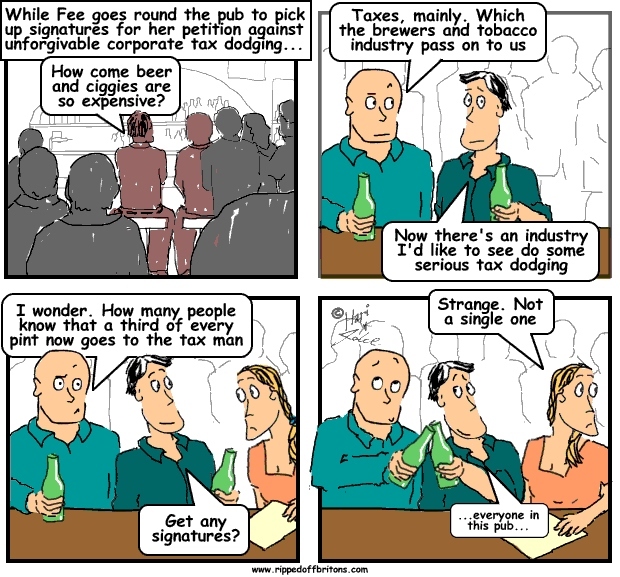 A third of every pint now goes to the tax man. The UK is a global leader in tax dodging services. Is Cameron serious about closing it down? The US fines and jails the Big 4 accountancy firms for helping tax evasion. The UK doesn't. Why?